Achieving excellence, one step at a time. Team Kaizen - Get involved! 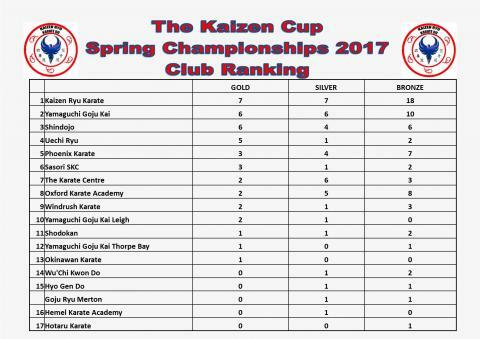 Congratulations and well done to all the competitors who competed in the Kaizen Cup Spring Championships. The day was a competitive, friendly and a fun way of testing their skills against some of the very best karate ka around the country. The Kaizen Cup is one of the established & popular tournament in the Southern England competition circuit, attracting top quality students from around the country to compete for the Kaizen Cup Trophy. We hoped that whether you won or lost, you all had an enjoyable day and learned a lot from your experience. These events are made possible by the team of volunteers who work together tirelessly behind the scenes and all the officials, judges and referees who gave up their day. As well as, all the competitors and their supportive coaches, family and friends. Thank you, it has been another successful Kaizen Cup this year and even better, by finishing earlier than scheduled.